We recommend 7x6 or 8 x 4 propeller and an Enya Number 3 plug in general running. Enya always quote useful BHP and RPM figures, in tests this engine always perfomed better than the factory stated figures ! 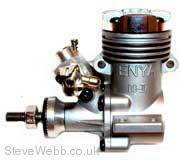 The first engine Steve Webb ever bought with his own pocket money was an aero Enya 09 engine. The engine he bought is over 30 years old an still runs first flick after hundred of hours and many years use.Enya Engines last . What more can we say ?